Jewish families that lived in Munkács and nearby villages used the Munkács cemetery as the final resting place for their loved ones. The old Munkács cemetery had some 1,520 burials. In the 1960's the Soviets earmarked the cemetery for commercial land use. Those who could, moved the mortal remains of their loved ones to a new cemetery site nearby. Alas, most remained behind. World-wide public pressure led the Soviets to abandon that project and the cemetery grounds was left as is. Unfortunately, most of the tombstones had already been removed so, today, it is very difficult to locate anyone buried there to say Kaddish over them. When they cleared the cemetery of the tombstones, four large pits were dug and the tombstones were pushed into the pits. Probably, many of them broke when that happened, yet some may have remained in-tact. It would be a very expensive effort to raise all of the tombstones and reassembling the broken stones would be a herculean task. A list of the loved ones buried in the old cemetery may be found below. The old Munkács cemetery is in Mukacheve and the new Mukacheve cemetery is located on its outer limits, to the east south east. (refer to map below). Then click the search button to "fly there." 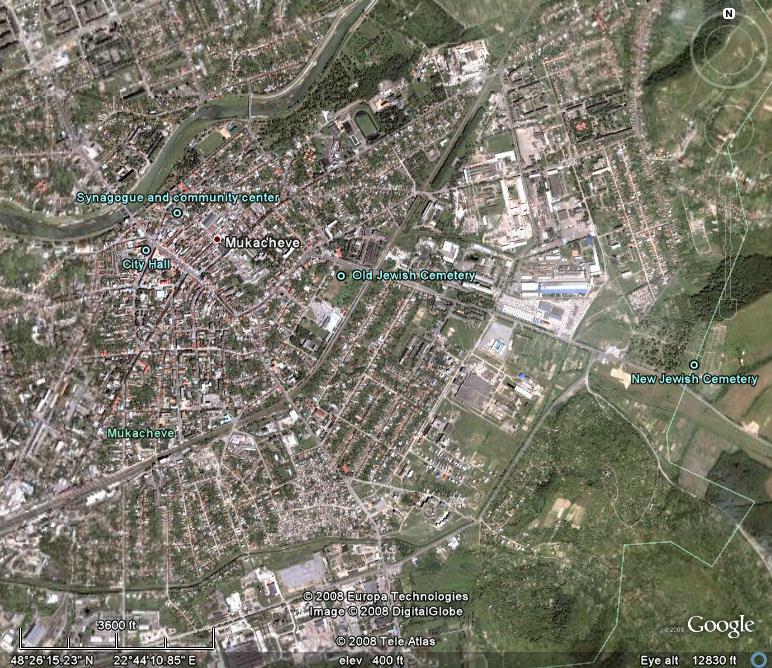 If you don't have Google Earth installed on your computer, click the Google Earth image to the right to see a screen capture of a satellite view of Mukacheve that has annotations for the old and new cemetery, synagogue, town hall, etc. Image: Copyright © Google Earth. The following images were taken before destruction of the old Munkács cemetery and were contributed by descendants. Shown in the photo is Avraham's daughter, Ilona (née FULOP) SCHONFELD (Louis SCHONFELD's mother). 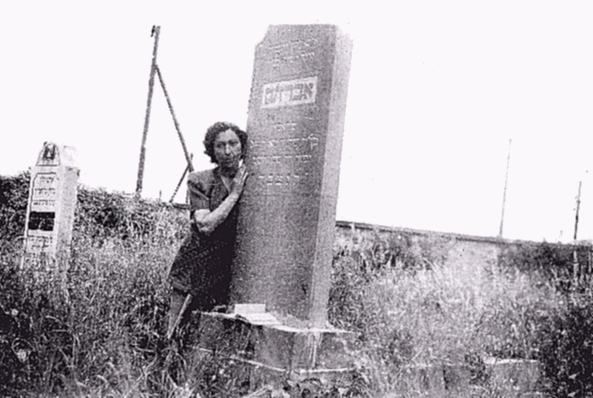 The photograph was taken in the summer or fall of 1945, several months after her liberation from Theresienstadt. 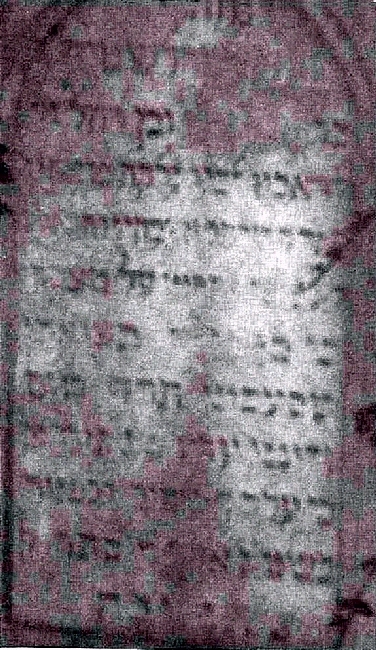 He was a respected advisor to Rabbi Lázár SPIRA who wrote the words for this tombstone.